Chamonix, France to Zermatt, Switzerland… Mont Blanc to the Matterhorn! The Haute Route is a spectacular high-level traverse in the French and Swiss Alps, below the summits of 10 out of the 12 of the highest peaks in the Alps, and crossing several high passes. The highest pass is at 2964 m (9,800 ft). The route is 180 kilometers long (about 120 miles) and gains more than 12,000 meters (40,000 ft) in elevation. This is a world of glaciers and towering, snow-capped peaks, green alpine valleys with flower-covered meadows and picture-book villages. 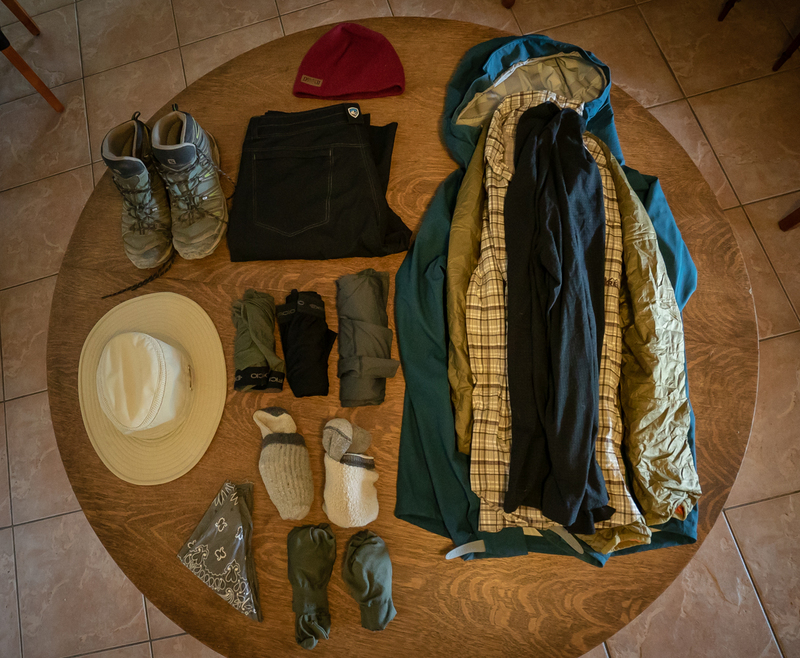 In this blog post, I’ll attempt to document the hike with photographs and trail descriptions. 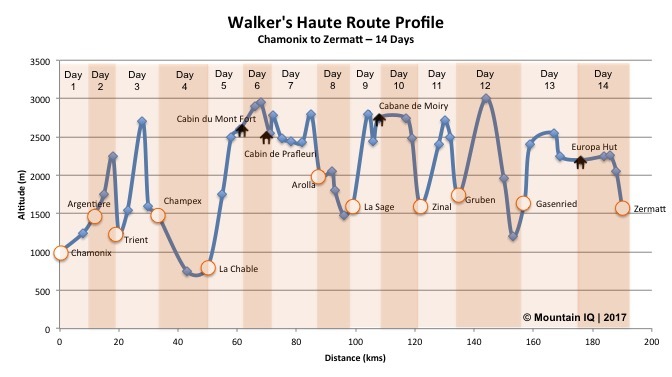 My primary navigational aid for this trip was Kev Reynolds’ excellent book: “Trekking Chamonix to Zermatt – The Classic Walker’s Haute Route“. 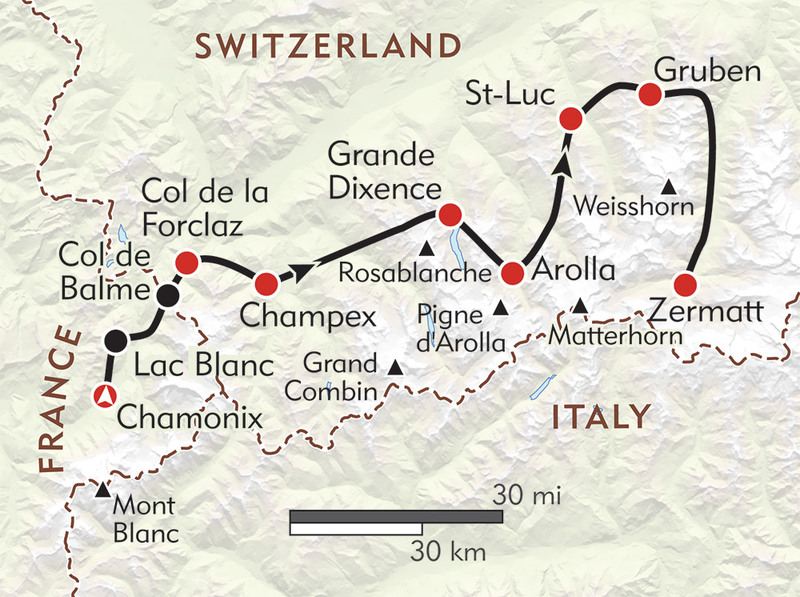 I also used three maps: Arolla, Martigny and Mischabel” to provide a “big picture” view of where I was heading. For GPS, I used the app: Gaia GPS on my iPhone, which came in handy several times! I got lost or off the path about a dozen times on this trip, but never too far astray, perhaps about 10 extra miles or so of wrong way wandering. For photography, I used a Trailpix, which is essentially a metal plate with three holes and thumbscrews, which you can insert trekking poles and a tent pole into to create a tripod. It’s not the sturdiest solution, but it’s super lightweight and worked fine for me. The most common way to get to the trailhead is to fly into Geneva, then take a bus to Chamonix. I flew from Phoenix to Frankfurt, and then proceeded to board a flight to Malaga… Thank goodness the ticket machine caught my mistake! Once in Geneva, you can collect a free train pass from a kiosk in baggage, good for 80 minutes. From there it’s just a short ride to the city center. I found Geneva to be a lovely, romantic city! Everyone is friendly and it’s not over run by tourists. It also seemed like very family-friendly city. I wandered around for about two days and visited many of the city highlights: United Nations and the Broken Chair, Botanical Gardens, Bain’s Des Pâquis, Place du Bourg de Four in Old Town, St. Pierre Cathedral, the Flower Clock and the iconic fountain, Jet dEau. On the first night, I was lucky to see a massive fireworks celebration over the lake! It’s a beautiful city and I hope to come back to visit again. My first impression upon arriving in Chamonix and seeing the Alps for the very first time was “Oh my God… what the hell am I getting myself into?” These mountains, especially here at the base of Mont Blanc, are beyond imposing. They’re so aggressive and unforgiving looking! Chamonix, France is a vibrant alpine town – a Hiker’s Paradise! Surrounded by scary mountain peaks and loaded with shops, bars and restaurants, it’s heavy on the tourists, but a fun place to be! I picked up the supplies I needed that couldn’t be brought by carry on luggage: knife, corkscrew, fuel and tent stakes. I met with the high mountain office who told me conditions were good on the passes and recommended some maps. I spent two days playing here (took the cog train to Montenvers la Mer de Glace and Ice Cave, gondola to Mont Blanc, dining at 3842 Restuarant) and then picked up my food for the trek. Tomorrow it begins! My food stash at the start of the trip: local cheeses and sausage, pear, bread, wine, chocolate, potato chips, trail mix. I have to admit that my nerves were getting the best of me on the morning of the first day, as I packed my gear and prepared to launch into this adventure. There was so much unknown and the language barrier was bothering me more than I thought it would. Instead of taking the direct route into Trient, I opted for a bit longer (and more scenic) route, climbing higher over a nearby pass toward Refuge Les Grands. This is a route not taken by many people and so I essentially had the mountain to myself. I descended down through a sheep pasture with expansive views all around. You’re technically not supposed to “wild camp” in Switzerland, but the farmer happened to be herding his sheep and goats through and gave me his permission. So I spent my first night in the Alps in solitude, drinking a half bottle of wine and watching the sun set – sublime. The stars were good as well, with the Big Dipper framed perfectly by my tent door in the NW sky. At one point I saw a massive shooting star arc directly into the Big Dipper’s cup! The path into Le tour was lush with ferns and succulents. My campsite on the first night. The next morning I descended more than 3000 feet over three miles on the most bone jarring route ever… and then stopped for breakfast in a public campground just outside Trient. From there, it was up and over the Col de la Forclaz. At that point, there are two options: Up and over the Fenetre d’Arpette or across the Alp Bovine, both leading to Champex. I chose the Bovine route because the weather was a bit threatening and this was a safer route. I ascended a fairly steep trail through heavy forest, with occasional views into the valley of Trient far below for a couple hours. I finally crested the pass in the early afternoon and was rewarded with expansive views and a lovely little cafe! The Alp Bovine is out there in the middle of nowhere, serving up delicious food and drinks. It’s so remote that they receive their supplies a couple times a week by helicopter! I ate freshly made apricot pie and drank a beer while soaking in the views from the covered patio outside. The weather was absolutely perfect and it was a wonderful way to take a much needed break. From there, it was more descending down, on another very steep and slippery trail. Progress was a bit slow as the footing was quite slippery from the scree. I finally reached Champex, EXHAUSTED after 13 hours of hiking. Camping options were limited here – there’s one public campground (Campground Champex) and not many options for wild camping, so I paid the man 12 franc for a spot. It was noisy and crowded – a cacophony of dialects from around the world surrounded me throughout the night, but I was too beat to wander any further. Trail blazers or markers like this are the key to the hike. Most of the time you will find them painted on the rocks but occasionally there are metal ones. As long as you follow these markers, you’re in good shape and on an established trail. On the third day, a lovely level stroll through bucolic valleys above picturesque hamlets. I have to say, it’s quite relaxing to hike without worrying about bears or mountain lions or rattlers or scorpions! It took me a little while to get used to it, but eventually I relaxed and enjoyed the hike without peering over my shoulder from time to time. Also, EVERYONE says “Bon Jour!” in a friendly high pitched voice, especially on the first three days of the hike, when the trail is shared with the hikers on the Tour de Mont Blanc. I pass through Sembrancher, which seems like a quaint vibrant village at first glance, but it was quite deserted and depressed. I met a very nice elderly fellow hiker from Italy, and he was stunned to learn that I was camping along the route! The vast majority of people stay in Hiking Huts or B&Bs, and just carry a bit of food and clothing. 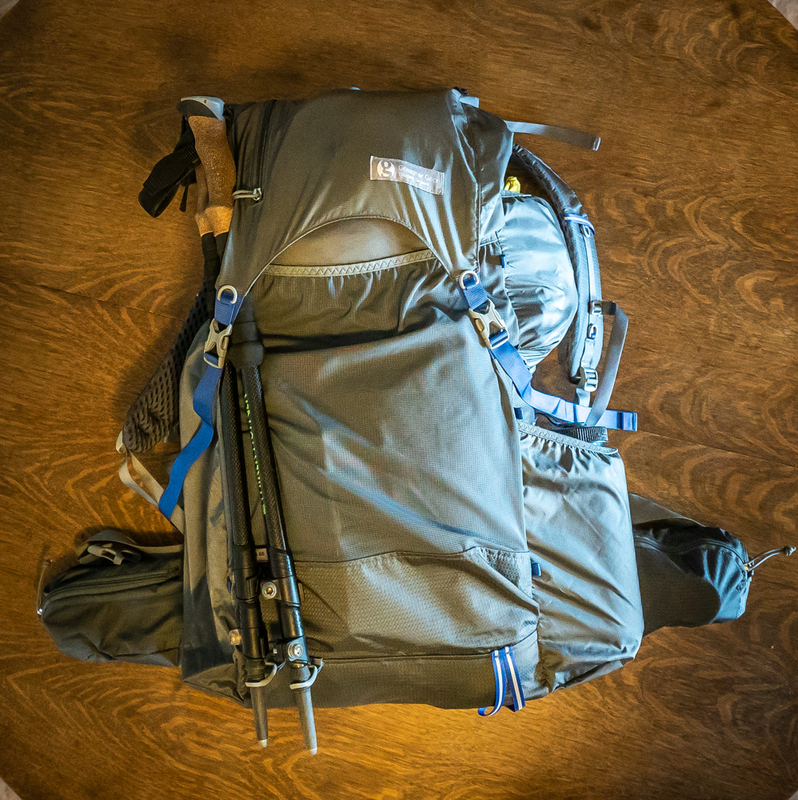 I was envious of everyone for their light load, but my full pack meant total freedom – I could stop and start pretty much wherever I wanted to. I couldn’t find a place for a snack or a coffee… so I continued on, strolling through a dense forest, which unfortunately ran along some major road construction. I finally arrive in Le Chable and it’s very nice! There are cafes and a few bars, so I book a room at the La Baraque B&B and have a couple beers at the bar below my room. Dinner is a bottle of wine and a pizza, then early to bed because the biggest, toughest day lies ahead tomorrow. I woke to another absolutely perfect day for hiking here, all uphill to a traditional hiking hut, Cabane du Mont Fort. Before making the ascent, I stopped in at the local tourist office, where I found out that since I had booked lodging in town, I was eligible for a full day pass on the massive gondola system there! The climb looked pretty daunting, so I took the easy way up and rode the gondolas! Once at the top, it was a relaxed walk through fields of wildflowers for a few hours to the Cabane du Mont Fort. There was a wedding in progress when I arrived, with traditional horn players serenading us all as we enjoyed the views from the deck. Stunning views in every direction! I relaxed on the expansive deck and drank several beers while eating my first ROSTI! Wow… where has this been all my life? Essentially hash brown potatoes with bacon and onions and cheese and all kinds of deliciousness! Inside the Cabane, there are about 20 small alcoves for sleeping in and dinner is done family style with large platters of pasta placed on the tables. I sat with the first people I’ve met on this trip who speak English and are also hiking the Haute Route: Dave, Emmy and Dave from Baton Rouge LA, and Mike and Patti from Brisbane, Australia. It was a great night of camaraderie. Pizza and wine in Le Chable after a long day of hiking – nice! Public water fountain in Smebrancher – a good place to refill water bottles and take a break. My room at Cabane du Mont Fort – perfect! After the first four days, I’ve hiked 64 miles and climbed 19,500 feet… and EVERYTHING hurts! But it’s another GORGEOUS day for hiking! After making a few wrong turns here and there, I finally found the trail towards Col Termin. Vast panoramas of the Corbin massif dominate the views, while the snow capped Combin de Corbassiere glowed in the bright sunlight. Here I run into Mike and Patti and Dave and Emmy and Dave again! it’s the second time running into Mike and Patti, and little did we know that we would be crossing paths two more times during this trek! From there, I hike across the start of what would be MANY moraine crossings… sections of the route that have been wiped out by rock slides. I pick my way across these boulders – some the size of a car, going from marker to marker. Two critical things in these sections: never lose sight of the markers… Don’t move forward until you spot the next one – so easy to get lost here! Also, every step requires intense focus and balance- one slip and you’ll twist an ankle or worse. My approach at this point was to embrace the challenge of the climbs and steep trails, finding joy in the struggle of the physical challenge and really acknowledging my gratitude to be in this situation. When the going got really tough, I found strength in the awesome beauty of the surroundings, the freshness of the wind, the flowers, the movement of the clouds and the god-like shafts of sunlight dappling the ranges. I tried to maintain this mindset throughout the trek and it really helped. I cross Col de Louvie and enter “the Great Desert” a desolate valley of dying glaciers, spectacular in scale but a bit depressing because of the grayness and erosion. At the same time, what a gift to be able to freely move through this majestic landscape. And it’s here that I spot a family of Ibex! Classic beasts of the Alps. I cross Col de Praflueri and see a massive storm cloud so I descend down to the nearest ledge (at about 9,000 ft) and set up my tent as fast as I can. Literally within a minute of getting all my gear inside it starts to hail… and then sleet… and then rain, for two or three hours. Everything was pitched well though and the Copper Spur performed awesomely – not a drop of water came inside. During the hail storm, I cooked a big pot of pasta carbonara, and ate it with a baguette and some wine. All from the cozy comfort of my sleeping bag. The storm eventually stopped and I enjoyed another clear night of star gazing with more meteor showers and an exquisite view of the Milky Way. The next morning was yet another clear day, and after a quick breakfast of coffee and protein bar, struck camp and headed toward Col des Roux. I crested the pass to receive the gift of a magnificent view of Val des Dix, a beautiful valley with a massive glacier-fed lake and the imposing Mont Blanc de Cheilon overseeing things. It was a lovely stroll along the lake for a few hours and then it was hell! Straight up the Col de Riedmatten… a name that will be forever etched in my mind as the gnarliest, scariest, toughest stretch of trail I’ve ever had to tackle. This was straight up – like my face was just a few feet from the ground… no trail… just make your way up the face of this thing. It took me about four hours to climb 1,000 feet, and I hated every step. At two points I lost my balance and nearly fell backward, which have been catastrophic. At the top there are chains attached to the rock and I actually had to pull myself up the last 100 feet or so. At this point I was really questioning myself about why I was doing this. Had I bitten off too much? So far the weather had been perfect, but if there was snow or heavy rain, this would have been almost impossible for me to accomplish, and then what? There’s no safety net here, no Rangers to call for help, no place for refuge, and as a solo hiker, I had no one to help me if things went wrong. I was ready to quit. I descended down, down, down to the tiny hamlet of Arolla, found a beautiful campground with great facilities, cooked up a couple pots of rosti with a bit of wine… and passed out.The next day I met some lovely people here, especially my neighbors, Sam and Mia from Milan! We enjoyed a couple beers together in the sunshine and relaxed… things were looking up! I decided to rest here for three days, exploring the area and regaining my strength. The campground was beautiful and comfortable and clean, and perfectly located within some nice day hikes. 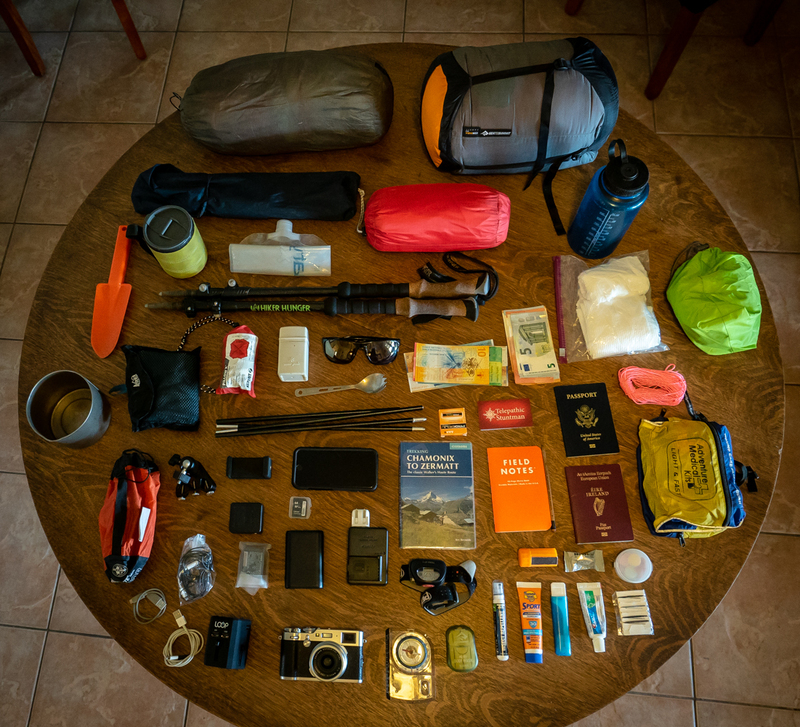 I decided to skip the next section of the route to make up for the time I spent in Arolla, and take the bus to Zinal, where I would resume the trek. My new friends and camp neighbors, Sam and Mia! Arriving in Zinal, the first thing I noticed is that by looking directly up the main street, I could see the Matterhorn for the first time! It was exciting to see the final destination, even though it was still four or five days away. I booked a small room here and hung a clothesline to dry my tent and gear, then headed out to explore this nice alpine village. There’s a good selection of restaurants and shops here, so it was quite amazing to walk into the restaurant below my room and see MIKE AND PATTI! We had dinner together and shared stories and photos of the past few days and had a great night of catching up. I woke the next morning to a light rain and a hike straight up the mountain all the way to above the treeline. From here I enjoyed fantastic views of the valley and the Matterhorn for the rest of the day, traversing along massive green hills dotted occasionally with small farm huts. My plan today was to veer off the standard route and instead go to Cabane Bela Tola, known for the epic views, I thought it would be worth the extra miles for the photography opportunities. The rain eventually stopped and my day was spent walking at a relaxed pace through mountain pastures, sometimes through a bit of fog at the higher elevations, but emerging frequently for fresh views of the tiny hamlets far below in the valley. When I arrived at the Cabane, I was thrilled to see the location, it was indeed perfectly located on the edge of a fantastic view point. I was also informed that I would be the only guest in this massive place! The host was really nice – he made sure I had plenty of wine, cooked a meal for me and informed me that he would be leaving for the night – so I would be here all alone! I paid him in advance since I would be gone before he returned the next day, and he showed me where to find more wine and how to make breakfast for myself. So I dined alone in the huge dining room, had my pick of beds from about a hundred choices, and hit the hay. It was quite eerie there at night – it felt very much like “The Shining”, being alone in a big empty lodge in the middle of nowhere… and I slept a bit uneasily, wondering what I would do if I woke up and say someone standing there in the middle of the night. But at the same time, it was pretty cool and a once in a lifetime experience! My goal on this day was to make it to Gruben and stay there for the night. I trekked to Bela Tola lake, taking in epic views to the south and crossing several small streams. The climb up to the crest of the Meidpass was nicely graded and at this point my legs had become conditioned to the steep climbing, so I made quick work of the ascent, not stopping until I reached the top. From there, it was an easy descent down through fairly barren ladscape strewn with rocks and pools, and grazing cattle… BIG cattle with even bigger cowbells! This was traditional Swiss alpine farming landscape. I reached Gruben and it was just past noon, so I ate lunch at the hotel and carried on, making my way back up the mountain under a steady rain. Near the top of the Augstbordpass, I found a flat, protected place to pitch a tent. The rain was coming down much harder now, and starting to turn into sleet. Soon that sleet turned to snow and I began to worry just a bit… I had neglected to check the weather reports and for all I knew, this could be the start of a major storm! It was getting much colder as well, by far the coldest night of the trip. My campsite was quite a good distance from the trail, so I knew that if things went bad, I would have a lot of difficulty finding my way back to the trail in the snow and no one would be able to find me – I needed to start planning for the worst. I inventoried my food and water situation… I had enough to wait this out for three or four days if needed. I finally fell asleep, hoping the storm would stop by morning. The next morning, my tent was caked in snow and I apprehensively opened the rain fly to check out the situation… CLEAR BLUE SKY! Yes, I would be fine as soon as some of this snow melted and I could pick up the trail again. I climbed Augstbordpass in the whipping winds and bitter cold and was rewarded by another epic view of the valley on the other side – my destination for the end of the trek! I descended down through some of the best scenery of the entire hike, finally gaining sight of St. Niklaus, which is where I would end the hike and take a train to Zermatt. I passed through the lovely hamlet of Jungen and then took a small gondola down the final few miles to save my knees. I caught the train to Zermatt and that’s where I finally saw the Matterhorn in its full glory! I set up camp in the Zermatt campground. It’s noisy and crowded but the facilities are great and the location can’t be beat – it’s located near the heart of the town and super cheap! I stayed there for three days and explored Zermatt and the surrounding area… and on my first day of checking things out, guess who I ran into? Mike and Patti again! We couldn’t believe it – this is now our fourth meeting on the trail… so of course we had lunch and couple beers together before parting ways… for now! It was a grand adventure, chocked full of amazing views and difficult challenges. The language barrier was tough for me as well – I had prepped some French and German, but not enough, so that made communication difficult. But overall, it was a fantastic trek! Embarking on another extraordinary adventure. Phew! Day 5 looks like a doozy! Have an awesome time Kev. I’m so glad for you, Keven, that you get to do, and can do, such an adventure! Looking forward to more reports! I love the pictures of the horns and horn players, exactly what I would envision the Alps to look like! Be safe and enjoy the last half of your journey. I really enjoyed looking at the pictures and reading about your journey. Love the pictures of the horns and horn players, exactly what I envisioned the Alps to look like! Be safe and and say hey to Heidi and her grandpa for me. hi kev , love seeing your posts and am in awe at how awesome you are x especially as your are my amazing cousin too !!! you have always pushed yourself to the limits and suceed to see great things. x proud of you cuz abd will keep watching you go !!!! Thank you for sharing your inspirational solo trek. It looks as though you had some challenging conditions at times so well done for toughing it out. Superb photography as always. I’m looking forward to retirement, when I can attempt to emulate you. Done!!! Now you have to do it again, this time the other way, right? Glad you made it through, and it sounds like without major mishaps. Hope you celebrated with at least a couple of beers. Can’t wait to hear the full story and see any more pix that you took. These photos are breathtaking! I’m so glad you finished and are safely united with Debi. We miss you both. I look forward to to hearing and seeing more of your trip.